Light blue with the national flag in the canton and the air force roundel in the fly, in accordance with British influenced practice. Sri Lanka is a little bit different because the green and orange panels of the national flag are not included in canton. 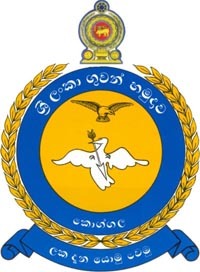 "When the Royal Ceylon Air Force was established on 2nd March 1951 with Air Cdre. 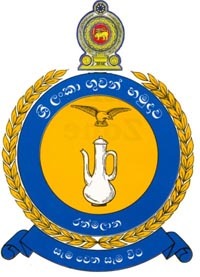 G C Bladen as the Commander a proper ensign had not been designed for the Royal Ceylon Air Force. 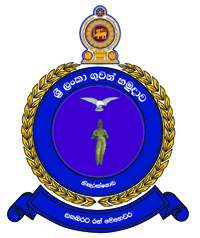 On 23rd February 1951 a commission was appointed to decide on the National Arms and Badges of Ceylon, and ceremonials and other uniforms. On 27th November 1951 the commission has recommended the use of the Air Force ensign. Air Force has replaced the Union flag of the RAF ensign with the lion flag which was the flag of the country at that time. 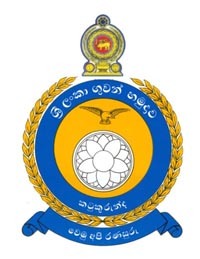 The ensign is in sky blue colour with lion flag in the top left hand corner whilst the modified roundel of the RAF in the right hand corner"
The air force ensign is presented with a new roundel, adopted in 2010. 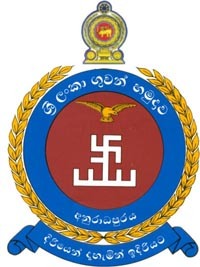 I attach a picture of a Lankan FT-5 with the new roundel, in support of my comment. I just came across a series of pictures of active Lankian aircraft in support of the comment regarding new roundel (http://www.airfighters.com/photosearch.php?for=120). The "wings" on the sides of roundel, apparently mimic the RAF tradition of differentiating squadrons in this way. 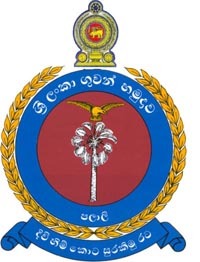 Maroon and yellow vertical stripes are the Sri Lankan Air Force fin flash which are the colours of the old flag of Kandy, the ancient kingdom in the centre of the island. The Royal Ceylon Air Force Ensign (1951 - 1971) according to Wikipedia (http://en.wikipedia.org/wiki/File:Ensign_of_the_Royal_Ceylon_Air_Force.svg). 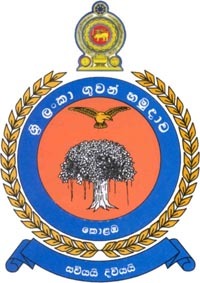 The Royal Ceylon Air Force was formed in 1951 and became the Sri Lanka Air Force in 1971. The same markings have been used since its formation until today. When British aircrafts flew in battle for the first time in the First World War, they had no national markings, they were fired upon with equal impartiality by friend and foe from the ground. To enable British forces to identify British aircrafts, the Union Jack was painted on the upper and lower planes. Unfortunately, unless the aircraft was flying very low the cross on the Union Jack looked very much alike the German marking , and this did not solve the problem. In October 1914, it was decided to adopt the more easily distinguishable three circles of red, white and blue then in use by the French Air Force, but the colours were reversed to blue white and red by the British. This roundel became the unofficial badge and battle colours of the British Air Force during the 1914-1918 war and have been carried into battle in all parts of the world. The RAF takes a very big pride in maintaining this symbol known as the roundel in their aircraft. The RAF pamphlet “Customs of the Services” states that countless numbers have died maintaining its prestige. 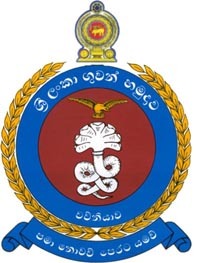 However when the Royal Ceylon Air Force ensign was designed in 1951, the RAF roundel of blue white and red was slightly modified by adding two wings of yellow and red/crimson to either side of the roundel. (Colours of the lion flag which was the flag of the country at that time.) 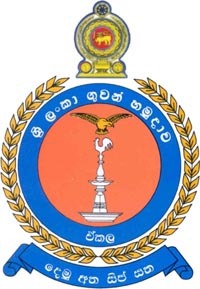 The Royal Ceylon Air Force then like other Air Forces decided to use this roundel as an Air Force ensign with colours of the flag of its particular country. 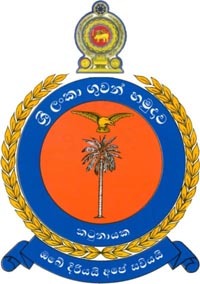 Subsequently the three circles were changed to two circles of red/crimson and yellow with green and saffron wings depicting the colours of our present National flag of the country." 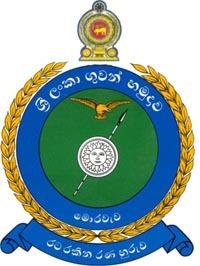 On the website of the Sri Lanka Air Force, in the section about its Bases/Units, are shown different flags (horizontal tricolours with a badge/emblem in the middle), which are probably the flags of the Bases or of the Units that serve them. In the left upper corner is shown the emblem and in the right upper corner the flag. Here is the link to the first of the Bases: http://www.airforce.lk/est/kat/kat.htm, and for the others you can chose from the left menu. 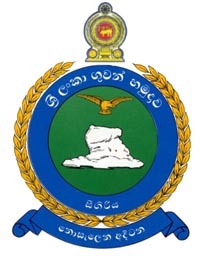 As an example the flag of Katunayake Base is shown here. 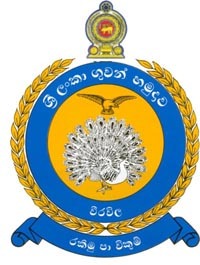 Special Operations Group Puliankulam: No flag nor coat of arms reported. Palavi: Flag No flag nor coat of arms reported. 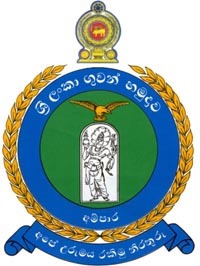 Special Operations Group TCO: No flag nor coat of arms reported. 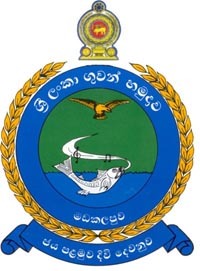 Mirigama: No flag nor coat of arms reported. 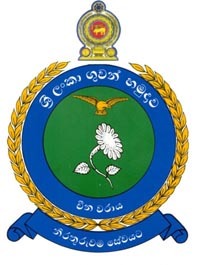 An example of the Sri Lankan Air Force Bases flags' is this picture: http://museum.airforce.lk/uploads/50th_anniversary_air_force_17.jpg, during the Sri Lankan Air Force 50th anniversary. The picture is taken from the Air Force Museum ( http://museum.airforce.lk).